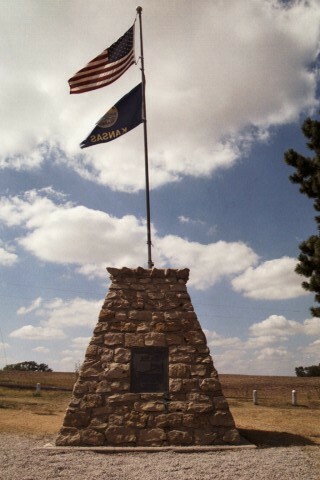 The Geographic Center of the United States is marked by a pylon and flag, erected by the Army Corps of Engineers. Not to be confused with the Geodetic Center (marker in Osbourne , Kansas, actual center at Meade’s Ranch), the Geographic Center takes into account the contiguous 48 states and is determined based of area. The site has an old abandoned motel, too, sometimes used as a hunter’s lodge, but also featured in Neil Gamon’s book “American Gods”, a fiction novel that features roadside attractions as power centers. Located by L.T. Hacadorn of Paulette & Wilson - Engineers and L.A. Beardslee - County Engineer. From data furnished by U.S. Coast and Geodetic Survey. Sponsored by Lebanon Hub Club Lebanon Kansas April 25, 1940. It's in the middle, but not quite smack dab. North-er than the geodetic center.